The top 10 new products that Food Processing and Friends find to be irresistible  over and over again. We dedicate this month's cover story to Diane Toops, our News & Trends Editor, who died Oct. 31 following a brief illness. Tracking new products was her favorite part of the job, and so this was her favorite cover story each year. This is one of our favorite projects of each year. We write about product introductions in every issue of Food Processing. Rollout and Food Biz Kids are devoted to them, and new products pepper our features on product development and sometimes even plant operations. But this is the only issue in which we put them on the cover. Every year we survey our full-time editors, freelancer writers and others who help us out and ask them for the new products that have delighted them during the year, the ones they actually buy, repeatedly, for themselves and their families. It's not scientific or comprehensive, but it is fun. The only rules are that the items are nationally available and "new," meaning introduced since July of 2011. We usually trot out that well worn phrase "new products are the lifeblood of the food industry." That's not entirely true, as quite a few processors make a nice living creating private label products, contract manufacturing for others or simply maintaining tried and true old products (like Coca-Cola). But like the birth of a baby – every one of whom could some day be president – a new product could be the next Coke or Oreo. Even if it's just the next Caffeine-free Coke, it could provide nice returns on your investment. New Product Introductions in the U.S.
Half-year product introductions in 2012 were ahead of those of the past two years, and appear to be headed for a strong full year. New product watcher Mintel Group sees product launches slowly recovering along with the economy. "In 2009 and early 2010, we saw new product introductions drop, due primarily because of the recession. At that time, companies cut back on their new product introductions in the U.S. market, across all categories and all types of products," says Lynn Dornblaser, Mintel's director of innovation and insight. "Since that time, however, we have seen increases overall in product introductions in food and beverage. The patterns are quite different from category to category, however. For example, the two largest categories with the greatest increases are Dairy and Snacks. "Dairy has shown strong increases in new product introductions in the past 12 months due mainly because of the impact of Greek-style yogurt, plus all types of yogurt," Dornblaser continues. "Snacks growth has come from alternate types of snacks -- for example, vegetable-based or unusual grain-based snacks -- plus an overall increase in snack bars and nut snacks. The Meals category also has shown growth, driven in part by meals formulated for two people and further expansion of vegetarian offerings. "Two of the largest categories that have shown the greatest decreases in the past 12 months include Bakery and Sauces. Bakery's decline may be due in part to the lack of 100-calorie pack type introductions [which boosted numbers in the recent past]. Sauces & Seasonings has slowed following strong increases in late 2009, which likely were driven by consumers choosing to cook more at home." A few facts and figures are all well and good, but nothing drives home the point like taste. And whatever else factors in for repeat purchases. 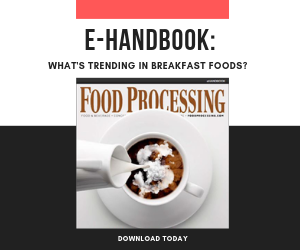 Following are the top 10 new products that Food Processing and Friends find to be irresistible – over and over again. By the way, keep this in mind: After Jan. 1, we will set up a yearlong poll on our web site so you can tell us what are your favorite products of all time. We'll give you 10 months to think about it. Next November, we will devote this feature to whatever products you specify. It should be interesting. It seems to me Red Velvet Cake came out of nowhere in the past couple of years to become everyone's go-to dessert when you want impress party guests or the host. I'm not sure what makes it unique – is red food dye enough to start this avalanche? Maybe it's the cream cheese frosting. Many recipes use buttermilk. Whatever, Blue Bunny Ice Cream, a brand of Wells Enterprises of LeMars, Iowa, last year introduced not only a red velvet cake flavor of ice cream but also several others. As if these cakes weren't decadent enough, imagine ice creams inspired by Carrot Cake, Triple Chocolate Cake, Strawberry Shortcake and Wedding Cake (each has a much longer name). Those are all in what we used to call half-gallons (now 1.75 quarts). Even newer, but only in pints, is Cup O' Coffee Cake. I'm not familiar with that last one, but I can say from first-hand experience all the others rely as much on the icing associated with each variety as the cake. And they're all dangerously good. They were developed with TV baker Jeffrey "Duff" Goldman, owner of Baltimore's Charm City Cakes and star of the Food Network's Ace of Cakes. His name is co-branded onto each one. Wells Enterprises is a company I've been fond of for a long time, and they're just the right size to take innovative chances like this. I'm eager to see what they come up with next. If it's a line of Belgian beer-inspired ice creams, I've died and gone to heaven! According to a recent survey of 1,000 women conducted by Hershey Co., 58 percent would love to savor their chocolate without guilt. Make that 1,001. I love chocolate and I love it even more when it feels healthier to consume. Hershey, Pa.-based Hershey Co. launched Hershey's Simple Pleasures this year, much to the delight of chocoholics everywhere. The creamy chocolates have crème-filled centers and contain 30 percent less fat than average milk chocolates. The Simple Pleasures line is also the first new brand from Hershey since 2007. Available in three varieties — Milk Chocolate with Chocolate Crème, Dark Chocolate with Chocolate Crème, and Milk Chocolate with Vanilla Crème — they are individually wrapped for easy portion control in a 24-count, 5.6-oz. stand-up bag. Each serving size, which includes six pieces (each about the size of a quarter), has 180 calories with 22g of sugar, compared to a Hershey bar which has 210 calories and 24g of sugar. The frozen foods aisle is overrun with branded single-serve meals, each promising the best ethnic or chef-inspired creations and easiest means of preparation. I regularly stock up on these easy lunch options to eat at my desk while writing articles such as this. Happily, one of the latest trends in this category has given my once rubbery microwave entrées flavorful texture. The secret is steam. Case in point: Stouffer's Farmers' Harvest Steam Meals-For-One, each of which is packaged in a "Steam Perfect Bag" to keep vegetables crisp, meats tender, pastas al dente and sauces rich, while offering the consumer a quick dining experience. Choose from Chicken Florentine, Creamy Shrimp Scampi, Five Cheese Tortelloni, Garlic Chicken and Cheesy Southwest-Style Chicken. Suggested retail price is $3.89. Your lunch hour will thank you. I love dairy products, and when I walk the ice cream aisle, anything new from Ciao Bella Gelato catches my eye. Ciao Bella's Pistachio Gelato is among my favorite desserts ever. So, when the company announced in January it would cross-pollinate the excitement of Greek-style yogurt with its own frozen dessert prowess, you could bet the results would be spectacular. The Adonia Greek Frozen Yogurt line, the first of its kind, includes seven flavors packaged in 14-oz. rounds, plus two flavors of bars in four-packs. Each is fat-free, and carries 130 calories or less, with 5g protein for the bars and 9g per half-cup scoop. That protein load is the centerpiece of Greek yogurt's game-changing popularity. I recently enjoyed the Vanilla and Mango. The smooth texture falls somewhere between ice cream and sorbet, and the flavors are bold, with a suggestion of tartness. Retail price in Chicago is $3.99. My favorite for the year is Gluten Free Chex Apple Cinnamon cereal from General Mills. With many friends adopting the gluten-free lifestyle, whether because of celiac disease or for general health reasons, these gluten-free cereals are great. Tasty and not really smacking of a "health food" to those that do not have an issue, these products are easy to serve and pleasing to all. The addition of Apple Cinnamon is a real plus, as it appeals to kids as well as adults and can be incorporated into recipes for additional options, such as a topping for crisps or ice cream. I am thinking gluten free will experience a heyday, then may fade as many trends have. But for the present, Gluten Free Apple Cinnamon Chex has a place in my pantry. How good can a 190-calorie frozen pizza be? New York-based Vitalicious Inc. made a name for itself by making wholesome muffins and muffin tops, then other nutritious baked sweets. This past summer, when the company stretched into a new category, microwavable frozen pizza, we had our doubts. Questionable too was whether any company could produce a pizza with just 190 calories. Multiple thoughts competed: "190 calories? Is that per slice?" and "The crust must be so thin it's see-through, right?" and of course, "I bet the box tastes better!" And none of those turned out to be true. VitaPizza is a 6-in. pizza, with a crust neither paper-thin nor heavy and thick, and there's no skimping on the topping. The next thing you notice is, it's not oily — no grease stains on the box, your hands, your shirt or in the microwave after you cook it (it only takes 4 minutes, too). The cheese and tomato has lots of good tomato flavor; the meatless pepperoni makes clever use of soy-based meat analog for a "nice-a spicy" kick. All in all, it's a tasty little number and it really is half the calories of its competitors. I'm no health food fanatic (see my earlier pick, Wells Blue Bunny Cake-Inspired Ice Creams), so it's no surprise I was smitten when Hostess Brands introduced Chocolate Crème Twinkies. The national baker tested them as a limited-edition offering in early 2011 (I think strawberry crème and banana also were explored in some test markets). After an overwhelmingly positive consumer response, it was clear adding chocolate to Twinkies was a recipe for delicious success, so they were made a permanent part of the portfolio earlier this year. The iconic golden sponge cake has been delighting snackers since 1930, but it's had surprisingly few brand extensions over the years. The little cakes get an unfair amount of derision – they are a poster child for empty calories, detractors claim they're sponge cakes filled with preservatives and there are suspicions they could survive a nuclear holocaust. But approximately 500 million Twinkies are baked every year, the product's web site claims. That's 1,369,863 Twinkies every day, 57,077 Twinkies every hour and 951 Twinkies every minute. And I'm not responsible for all of them. So they must have their fans. Plus, there's a business story here. I really hope Hostess Brands can claw its way out of its second bankruptcy in three years. It will take more than chocolate Twinkies to re-establish this company, but they're a start. Sunday is the one day my family sits down and enjoys the most important meal of the day. Like many American families with teenage children, the most popular item on our breakfast table is pancakes with syrup ... lots of delicious syrup. We've tested and tasted our fair share of syrups over the years, but IHOP's At Home Syrups have become a favorite. Glendale, Calif.-based International House of Pancakes launched IHOP at Home Syrups, this year. The full line of syrups feature Original, Liteand Sugar Free, plus the restaurant chain's signatures syrups Rooty Tooty Fresh 'N Fruity Strawberry and Rooty Tooty Fresh 'N Fruity Blueberry varieties. They are available at retail only through Sorbee International LLC, which holds the licensing rights to produce and distribute IHOP at Home Syrups. Suggested retail price for the Original, Lite and Sugar Free varieties (in 24-oz. bottles) is $3.99, and Rooty Tooty Fresh 'N Fruity Strawberry and Rooty Tooty Fresh 'N Fruity Blueberry varieties (in 12-oz. bottles) cost $2.99. Who doesn't love a milkshake? Well, this one is not frozen, but when served chilled direct from the refrigerator, it tastes just as great. Unlike other protein beverages in the market, new Core Power high-protein recovery drink from Chicago-based Fair Oak Farms Brands uses farm-fresh milk, not reconstituted dairy solids that can produce a chalky aftertaste. It's that clean taste that has made Core Power a favorite in my household since its official launch this past summer. The company's unique cold-filtration process yields fresh milk with increased amounts of protein in the same ratio naturally found in milk: 20 percent whey and 80 percent casein. I personally prefer the Strawberry Banana Light version, which is sweetened with a touch of honey (like all the varieties), but keeps calories and sugar content low through the use of monk fruit juice concentrate and stevia leaf extract. I approve of these low-calorie natural sweeteners for my kids, too. There's also a light chocolate variety that my 10-year-old is partial to as an after-school snack. The light versions contain 20g of protein per 11.5-oz. bottle, while the others, which come in Chocolate, Honey and Vanilla flavors, contain 26g of protein. The protein satisfies mid-afternoon munchies. Core Power comes in recyclable plastic bottles and is aseptically packaged so it can be distributed -- and stored at home -- in a shelf-stable environment until chilled before consumption. I am in Chicago where Core Power made its initial launch. Coca-Cola Refreshments recognizes the potential of Core Power and recently added it to its distribution system so that the rest of America can enjoy. American Roland Food Corp. hits all the right notes with its quick and easy Flavored Quinoa. Easier than Easy Mac and deliciously healthy, these gluten-free quinoa dishes can complement practically everything from meat, chicken and fish to the lowly lentil, and also be sublimely satisfying by themselves as all-in-one-bowl meals. Consumers yearn for meals that fall into one of three categories: quick, delicious or healthy. The Roland quinoa line-up satisfies all three and more. Made from nutritious Andean quinoa — rich in fiber and amino acids, and valued for its high protein and mineral content — they require nothing more than a pot of boiling water and 15 minutes to simmer. Containing only ingredients like garlic, onion, tomato, carrots, celery and sea salt, the Roasted Garlic, Garden Vegetable, Lemon Curry, Toasted Sesame Ginger and Mediterranean Quinoa are all just what the doctor ordered for dieters and athletes everywhere. Even more compelling: The United Nations' Food and Agricultural Organization has declared 2013 to be "The International Year of the Quinoa." Our 'love' list includes 10 treats we can't seem to get enough of this year. Our annual review of the favorite new foods and beverages introduced this year.